In 1962 the Wildcat was a Buick Invicta subseries, mating the Invicta's longer full-size two-door hardtop Buick body (known as the "sport coupe", body production code 4647) with a high-performance 325 hp (242 kW) version of the 401 cu in (7 l) Nailhead V8, known as the "Wildcat 445" for producing 445 lb⋅ft (603 N⋅m) of torque. To further distance itself from the Invicta, the Wildcat had Electra 225-like taillights, a bucket seat interior, and a center console with tachometer and transmission shifter. It had a Dynaflow transmission shared by all full-sized Buicks, plus special exterior side trim, vinyl-covered roof (new for 1962), and its own unique emblem: a stylized head of a wild cat, located on each of the C-pillars. However, the Wildcat did share the LeSabre's and Invicta's trio of VentiPorts on the front fenders, a design cue lasting only through the 1963 model year. From 1963 to 1970 the Wildcat was its own series, no longer an Invicta subseries. The 1963 model had a large aluminum trim panel on the side of the body that seemed to compete directly with the Oldsmobile Starfire, another full-size "sporty" model by GM. Wildcats built in the 1964 model year did not have the traditional horizontal VentiPorts like other Buicks, but instead had vertically situated chrome hash-marks on the lower front quarter panel directly behind the front wheel housings. After becoming its own full series in 1963, the Wildcat added a convertible and four-door hardtop sedan to the original two-door hardtop coupe introduced in 1962. In the four-door version, a bench seat was standard but the bucket seat and console interior used in the coupe and convertible were optional. In 1964, a pillared four-door sedan was added to the line and two levels of trim were available - standard and custom, with a mid-line deluxe subseries added for 1965 only. 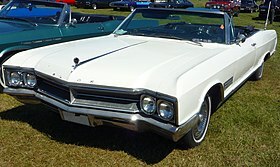 From 1966 to 1969, the base (with trim similar to the 1965 Wildcat deluxe) and custom trims were again the sole options. 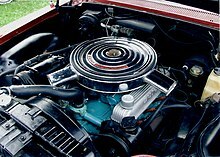 The 325 hp (242 kW) 401 cubic-inch Wildcat V8 remained the standard engine through 1966. From 1964 to 1966 a larger, 425 cubic-inch, Wildcat V8 was also available, producing either 340 hp (254 kW) with a factory four-barrel carburetor or 360 hp (268 kW) with 2 four-barrel carburetors ("dual quads"). This version also featured finned cast aluminum valve covers with the Buick logo embossed on the top. Also beginning in 1964, a three-speed manual transmission with column shift became standard equipment on all Wildcats, with either the four-speed manual (1963-1965 only) or three-speed automatic Super Turbine 400 transmissions as options. Engine names referred to engine torque output rather than displacement. The "Wildcat 445" was a 401 CID V8 that produced a peak torque rating of 445 lb⋅ft (603 N⋅m), while the "Wildcat 465" was a 425 CID V8 that produced 465 lb⋅ft (630 N⋅m) of torque. The "dual quad" version of the Wildcat 465 was dubbed "Super Wildcat". In 1966 a one-year-only Wildcat "Gran Sport Performance Group" package could be ordered by selecting the "A8/Y48" option. Two engine choices were available. The single carb 425 CID/340 hp V8 was included in the base package price with a 360 hp (268 kW) dual-carb set-up available at extra cost. Initially, this 20 hp (15 kW) upgrade remained a dealer-installed carb-intake modification bolted to stock MT-coded engines but eventually these "Super Wildcats" could also be obtained direct from the factory with MZ-coded engines. Rounding out both the base and Super GS packages were dual exhaust, heavy-duty suspension, posi-traction and updated rear quarter-panel "GS" badging in the new, initials-only format employed on all post-1965 Gran Sports. A total of 1,244 Wildcat GSs were built by Buick during the model year. Of those, 242 were convertibles and the rest were hardtops. A mere 22 (consisting of an unknown mix of both body styles) were Super Wildcats. A styling appearance cue was adopted from the popular 1963 Buick Riviera, where the beltline arched up over the rear wheels, a modification of an older styling element called the "Sweepspear", with later vehicles installing a rub strip along the entire side of the vehicle tapering down as it reached the rear bumper. The year 1967 brought a new engine to the Wildcat line (along with the Riviera and Electra 225) – a 430-cubic-inch V8 with four-barrel carburetor and 360 hp (268 kW) rating that featured larger valves for better breathing than the previous 401/425 Nailhead design that dated back to Buick's first V8, in 1953. It had a 10.25:1 compression ratio and a four-barrel carburettor, with maximum power reached at 5,000 rpm and 475 lb⋅ft (644 N⋅m) of torque at 3,200 rpm - all SAE gross values. The 430 was relatively short-lived as it was only offered through the 1969 model year. For 1970, the 430 was superseded by the largest Buick V8 engine ever – a 455-cubic-inch engine that was basically a bored version of the previous engine with the same large-valve design, a horsepower rating of 370, and torque rating of more than 500 pounds. 1967 and 1968 saw the addition of new federally mandated safety equipment that provided better occupant protection in collisions, and accident avoidance features as well. Like other full-size U.S. cars of the late 1960s, the Buicks became bigger, plusher, and less economical. The 1965–1970 GM B platform is the fourth-best selling automobile platform in history after the Volkswagen Beetle, Ford Model T and the Lada Riva. Buick has used the name "Wildcat" for five concept vehicles, three in the early 1950s, one in 1985 and another in 1997. The 1953 Wildcat I, 1954 Wildcat II and 1955 Wildcat III were all designed under the guidance of Harley Earl. The I and II still exist today. The 1985 Wildcat was a radical mid-engined, all-wheel-drive sports car with an exposed high-performance, double-overhead cam V6. The chassis was built of carbon-fiber and vinyl-ester resin and the body featured a 'lift-up' canopy for entry and exit. This futuristic vehicle is still owned by Buick today, and is still operational. ^ Flory, J. "Kelly", Jr. American Cars 1946-1959 (Jefferson, NC: McFarland & Coy, 2008), p.1022. ^ a b "Directory Index: Buick/1963_Buick/1963_Buick_Full_Size". Oldcarbrochures.com. Retrieved 2011-12-31. Wikimedia Commons has media related to Buick Wildcat. This page was last edited on 24 October 2018, at 09:23 (UTC).